There are so many great outdoor activities in Ohiopyle besides whitewater rafting! In fact, over 2.5 million people visit the Ohiopyle State Park every year and only about 80,000 of them get on the river. So, what are all those other people doing? Let’s take a look atthe two newest activities Ohiopyle has to offer. The most popular new activity is found at Ohiopyle Zip-line Adventure Park. The Adventure Park offers more than just zip-lining. It includes nine aerial challenge elements, three on the Explorer level and six on the Adventure level, as well as two zip-lines. Most zip-line parks in the Laurel Highlands and surrounding areas cannot accommodate younger children. Not here! Children as young as four can participate on the Explorer level at Ohiopyle Zip-line Adventure Park. This high-flying fun is great for adults too! The Adventure level can accommodate children 10 and up. Another new and exciting activity can be found at the Ohiopyle Mining Company. Purchase bags of “mining rough” containing gemstone, arrowheads, or fossils at the Old Mill General Store in Ohiopyle, PA. Pour your bag of “rough” into a screen tray and lower the tray into the mining sluice of water. While you shift and shake the tray, watch as the water washes away the dirt and reveals your treasures. Both of these new activities are great for groups! Bring your family, scout group, or youth group! We offer packages for field trips and birthday parties. You can also package either of these new activities with a white water raftingtrip. If you need any assistance planning your stay in Ohiopyle, call one of our outdoor adventure specialists at 1-800-472-3846. 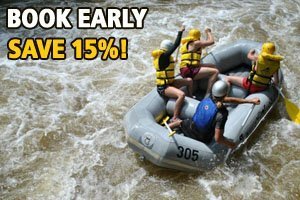 ← Getting Pumped Up for Spring White Water Rafting in Ohiopyle?